It is that time of year again: the time when we pack up our lives into boxes, debate what gets to stay and what has to go, and make shopping lists for all the things to buy for a new year at college. Although items like extra-long twin sheets and shower caddies rank high on the list, kitchen items are equally essential for college students. For the times when the monotony of campus food–thedining hall or take-out–sets in, cooking for oneself is the perfect antidote. Whether you are living in an apartment or sharing a kitchen with a hundred of your peers on your dormitory floor, here are the top eleven must have items for a first kitchen. 1. Cutting Board (or Two). After browsing the bounty at the local markets, you will need something on which to slice those luscious strawberries or dice the ripe tomatoes. Considering buying two boards, one specifically for cutting meat and another for everything else. If you splurge for a nice wooden one, then you can even use it as a serving platter for parties. 2. A Knife Set. After buying a cutting board, the next step is to purchase three proper knives. All kitchens should be stocked with at least a paring knife, a serrated knife, and a chef’s knife. Though your budget might convince you that one knife fits all, you might regret it when you attempt to saw your bread into crostini-perfect slices with a chef’s knife. 3. Measuring Cups and Spoons. Although T.S. Eliot famously wrote to measure your life out with spoons, when it comes to baking, the type of measuring utensil matters. For those late-night brownie cravings, having measuring cups for wet and dry ingredients is crucial. When not baking, use your spoons to measure out the perfect cup of coffee or to spice up a hot chocolate. 4. Hot Pot aka Electric Kettle. 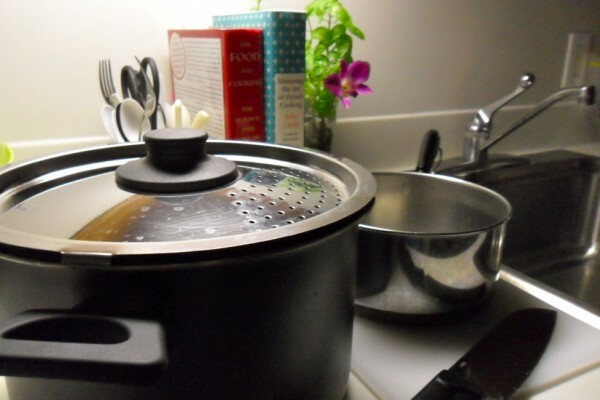 Even if you have access to a microwave or a stove, a hot pot is great for rapidly boiling water. Whether you use it to brew a cup of tea, to create bowl of instant oatmeal, or to cook college’s iconic ramen noodle dinner, one can find a thousand and one potential uses for the hot pot. 5. Can Opener. Admit it, we have all had that moment when reaching for a can of soup or beans only to realize we were without anything to open it. Instead of banging the can incessantly or dangerously stabbing the lid with a knife, invest in a can opener – your cutlery and countertops will thank you later. 6. A Large Pot, preferably a heavy-bottomed one. Pasta being the go-to college meal it is, you’ve got to have something to boil water, and pasta, in. If you can afford a large pot that’s ceramic, you’ll also be able to sauté onions and garlic evenly, making this a good choice for soups and chilis too. 7. Colander. Between the time when the water boils and dinner is served, pasta requires a proper draining. Flipping a pot with a slightly ajar lid may seem like a clever way of draining pasta water, but the risk of burning fingers and dropping the contents are high indeed. With a colander not only can you ensure pasta is cooked properly al dente, you can also use it to wash fresh produce or as a fruit bowl for the table. 8. Casserole Dish. Popular among the neighborhood crowds, potlucks are becoming more and more trendy in college circles. Although you might be tempted to try something fancy, you can never go wrong with a classic casserole. And don’t think casserole dishes are just for savory items; they are the perfect vessels for something sweet. 9. Ice Cream Scoop. A perfect sundae begins with the perfect scoop of ice cream. Use it to also measure out equal portions of cupcake and muffin batter. 10. Non-Stick Skillet. There is nothing worse than preparing a meal and then returning to the kitchen to see a collection of dirty pots that need washing. A good non-stick pan will ensure even heating and help conserve elbow grease in the cleaning process. 11. Lots and Lots of Tupperware. All those containers from deli meats and restaurant leftovers are worth saving. In addition to preventing food from going to waste, use Tupperware for storing flour and sugar, or to sneak food from the dining hall. When on a college budget, no food should be left to spoil. Good list, however not only is ceramic not so great of a heat conductor, but it is also very pricey and if dropped will shatter. Stainless steel is more affordable, is a better heat conductor, and wont shatter when dropped. Or you can opt for cast iron which is cheap, if cared for properly nearly non-stick and browns things beautifully. And it’s durable, you can give it to your grand kids.